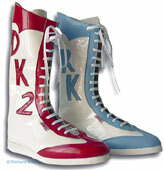 Wrestling boots customized for you direct from the factory. 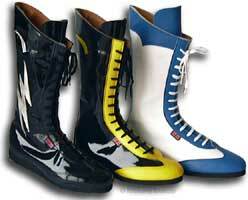 The designs here are to give you an idea of the scope in wrestling boot customization. Many of our clients have a specific logo on their boots which is relevant to their stage name, of course if you see a boot here that you want why not contact us and have it made. Don't forget we can change all colour's and designs to customer preference. Click on any boot to see more detail. These are just some of the many hundreds of custom boots we have made over the years. Sizes 5-12 please contact us for sizes up to 16.